An art learning center encourages creativity and development of fine motor skills. Learning centers consist of interactive materials and activities that focus on a particular skill, area of development or interest. Preschool classrooms often use them to encourage self-paced learning and exploration. 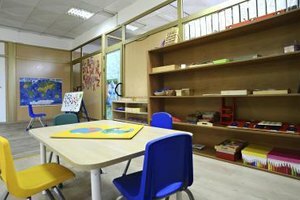 Setting up the learning centers in your preschool classroom requires attention to space, materials, accessibility and organization to create an effective learning environment. 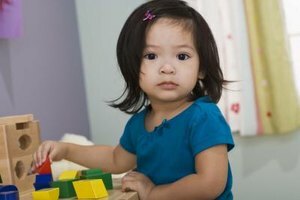 Most preschool schedules include a block of time for learning centers. All students go to a center at that time, so you'll need enough centers to accommodate your entire class. 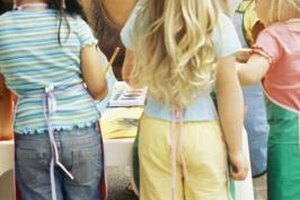 Depending on the activity, most centers should accommodate at least three or four students. Determine how many spaces you'll have at each center. Having multiple students in the center encourages interactive play and socialization. Too many students in one center can result in conflict or lack of materials and space. Early Childhood News suggests setting up enough centers to provide enough extra spots for one-third of the class. In a preschool class of 21, this means you should have seven extra spots in the learning centers for a total of 28 available places. Having several centers also gives the students choice and variety. The layout of the centers is another consideration. Each center needs enough space to allow the preschoolers to complete the activity. A center that involves physical activity requires lots of open space, while a writing center needs only enough space for the kids to sit and write. The kids also need an appropriate work surface for the designated activity. An art center might use easels or a large table, for example. Consider resources each center needs when choosing a location. Place your water table center near the classroom sink, for example. Leave enough space between the centers so the kids don't invade the other centers. Leaving space also minimizes noise interruptions. Put quiet centers, such as a reading center, in a secluded area. Using physical barriers, such as shelves, helps define the center spaces. The learning centers should address the specific skills or concepts you want the preschoolers to explore. 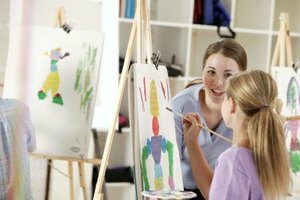 Most preschool teachers have set learning centers with specific types of activity, such as art, building, reading, writing, science, math, sensory table, computer and dramatic play. With the general centers established, the teacher changes the activities in each center to keep the learning fresh. The math center might include patterning with beads one week and sorting shapes the next, for example. The current theme and learning objectives help plan the activities. The learning center approach uses hands-on activities rather than paper-and-pencil worksheets. The materials should be age-appropriate and safe -- no tiny beads or toys with small parts, for example. 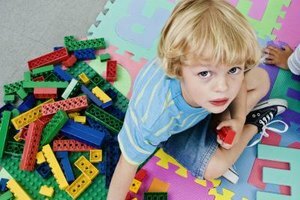 Centers are often filled with objects the preschoolers can manipulate and use for learning. A dramatic play center has dress-up clothes and props to fit the theme. Math centers often include counting beads, patterning materials and other manipulatives. A literacy center might include books, puppets and writing materials. The art center holds the materials needed for the specific project, such as paint, scissors and glue, plus paint shirts and clean-up supplies. A science center might include magnifying glasses, microscopes and nature items, such as rocks or leaves. A building center would include different types of blocks, such as wooden stacking blocks and interlocking plastic blocks. All materials for a given center need a designated storage container and area. Large items can go on shelves. Small items need a container with a lid to keep all of the parts together. Use labels to help the students get the materials back to the appropriate spot. Frost, Shelley. 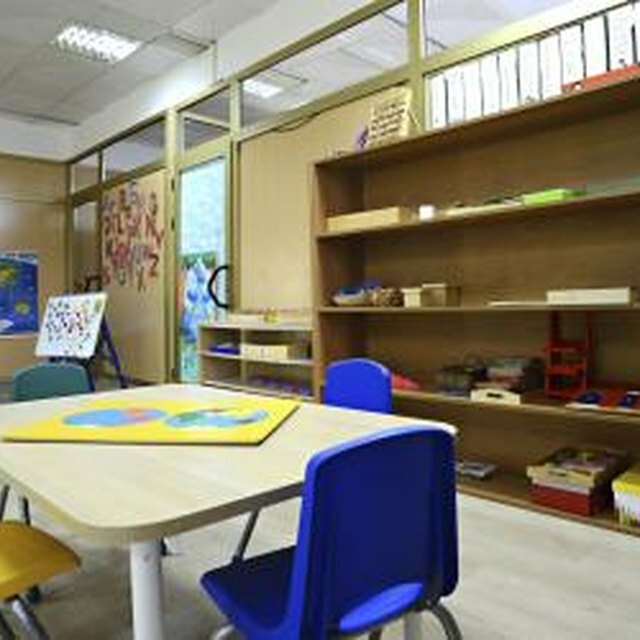 "How to Create Preschool Learning Centers in Your Classroom." Synonym, https://classroom.synonym.com/create-preschool-learning-centers-classroom-7725183.html. Accessed 23 April 2019.